What is the difference between HVAC and AC? | Grunau Company, Inc.
What is the difference between HVAC and AC? Acronyms in the construction industry can confuse building owners and others who are looking to upgrade or install mechanical systems in their facility. Let’s get back to the HVAC basics. An HVAC air handling unit is placed on top of a building. HVAC is an acronym that stands for heating, ventilation, and air conditioning. This means that the mechanical system provides comfortable, safe indoor air quality for a building. The design of a heating and cooling mechanical system can be complex or simple, depending on the mechanical engineering and building specifications. This mechanical system is an integral part of heating and cooling any modern building. AC is short for air conditioning. The terms HVAC and AC are often used interchangeably. CALL 1-800-365-1920 to speak with an HVAC professional today. A building can be heated by several methods, including a furnace, boiler, and heat pump that warms the air through central heating. In a large building, this is located in a mechanical room. The heat is transferred through different fuels in the form of solid, liquid or gas. Electricity can also be used to heat a building, through baseboard heaters. There are many ways to heat a building. The air conditioning part is integral in keeping a building comfortable in the summer. This includes providing cooling and humidity control. This is done through the removal of heat from a building, through radiation, conduction or convection. The materials used for this cooling process, called refrigerants, include water, chemicals, ice or air. These are then forced through a heat pump or cooling system. Dehumidification is processed through an evaporator, that condenses the air on coil tubes and collects moisture. The ventilation of the mechanical system is also important. Ventilation is what moves the air from the heater or air conditioner and directed to specific parts of a building that need it. There are many kinds of ventilation, including sheet metal or fabric. 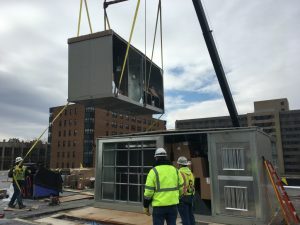 Grunau Company provides estimating, design, manufacturing, installation maintenance and HVAC repair on industrial and commercial HVAC systems in the Milwaukee area. CALL 1-800-365-1920 to speak with an HVAC professional today.